I’m back with another smoothie that I consider a mild detoxifier. It’s my belief that if you routinely consume foods and herbs that help the body detox, you don’t need to engage in extreme detox protocols or diets such as the master cleanse or olive oil liver flushes very often, if at all. Here’s how the primary detoxifiers in this recipe, watermelon and dandelion greens, aid the body in eliminating undesirables, which will reenergize your body, help shed excess weight, and improve your overall health. Your yummy, hydrating watermelon is particularly good at cleansing the liver and kidneys, and is also a great whole body cleanser. This combination of cleansing and hydration is great for your complexion and skin. 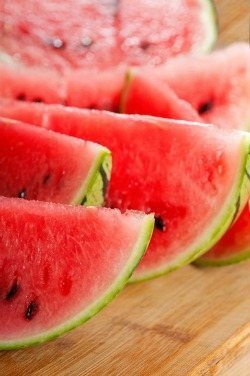 Watermelon’s high water content and low amounts of sugar and sodium have a slimming effect. Dandelion greens are considered by many to be the king of the cleansing greens. They help the liver and kidneys rid the body of toxins. Dandelion greens also support proper digestion and their diuretic and laxative effects aid in the elimination of toxins. Dandelion greens are also nutrient dense, containing high amounts vitamins, minerals (especially calcium), and antioxidants. They are rather bitter, unless picked early in the spring, which is why I like to “hide” dandelion greens in my green smoothies. If you’re new to dandelion greens and green smoothies in general, you may want to use 1/2 cup dandelion greens and 1/2 cup spinach to reduce the bitterness. It’s sort of an acquired taste in my opinion. Enjoy! I’d love to hear what you think of this watermelon dandelion greens detox smoothie – please leave a comment below. Happy Blending! Had it this morning, Great taste best smoothie so far. Love the flavor the cinnamon gives it. I would like to know about how many calories per cup. Thank you for a great recipe. Without a sweetener you’re looking at around 175 calories. Since this is a detox smoothie it isn’t meant to be bulky and fill you up, hence the low calorie count. Yum!! I subbed an avocado for the banana because I was out of bananas and it helped with creaminess.